Sangiovese is the most widely planted grape in Marche and Italy. Sangiovese plantings are losing ground to Montepulciano as it is favoured in Marche. The two are often blended together. Tart red fruit on the nose with a faint earthiness. Medium bodied with notes of blackberry and sour red cherry. Nice acidity with a well-structured tannic backbone. Easy sipper. Conero DOC is situated in the coastal hills surrounding Monte Conero near the capital city, Ancona. Pliny the Elder praised these wines in Roman times. This full-bodied approachable red is loaded with dense black cherry with nuances of baking spice and herbs. Round and ripe, this wine has a subtle peppery finish. Beef tortellini, BBQ hoisin ribs, tomato soup. A unique red grown in the hills surrounding the village of Morro d’Alba (not to be confused with Alba in Piedmont). An intensely aromatic nose of violet, rose and berries. Medium bodied with dark berries, plum and spice on the palate. Fine tannins lead to a soft pleasant finish. Spicy salami, steak with green peppercorn gravy, soft cheeses. Verdicchio from Marche was relatively obscure until the 60’s when it saw a surge in popularity. As the demand increased, the quality suffered. It wasn’t until the 80’s when a few producers, including Bucci, focused on bringing quality back to the region. Chamomile, peach and nectarine together on the nose and palate. Vibrant acidity with a stony finish. Matelica has just 300ha under vine, producing 1/10th as much wine as Jesi. Collestefano farms their vineyards and makes wine using organic practices. Herbs and citrus on the nose with peach and pear flavours on the palate. Crisp acidity with a distinct mineral finish. Oysters on the half shell, creamy seafood linguine. Offida is located on the coast in southern Marche bordering Abruzzo. Pecorino is the regions most prized wine. A pleasant nose of tropical fruit, flowers and citrus lead to a full body. Flavours of stone fruit, dried herbs and stone on the palate. Savoury and structured. Hard cheeses, cider brined pork, turkey dinner. Located in Central Italy on the Adriatic Coast, Marche (pronounced ‘mar-kay’) is somewhat isolated from the rest of Italy. Minimal urban development or major highways allow for the region’s heritage to shine., and rolling hills dotted with castles looking out towards the sea are a common site. The wines of Marche were mostly consumed locally until some clever marketing tactics launched the wines of Castelli di Jesi into the spotlight in the 1960s. Until the recent trend and resurgence of indigenous Italian grapes, the rest of Marche’s wines were largely unknown. Marche is known best for Verdicchio. Appelations around the towns of Jesi and Matelica are the best expressions. Verdicchios from Jesi tend to be fruitier and more floral. The wines of Matelica retain higher acid and are more citrus and mineral forward. Reds based on Montepulciano and Sangiovese have increased in quality and popularity, especially in southern Marche. The hills surrounding Monte Conero (see top cover photo) are ideal for Montepulciano. 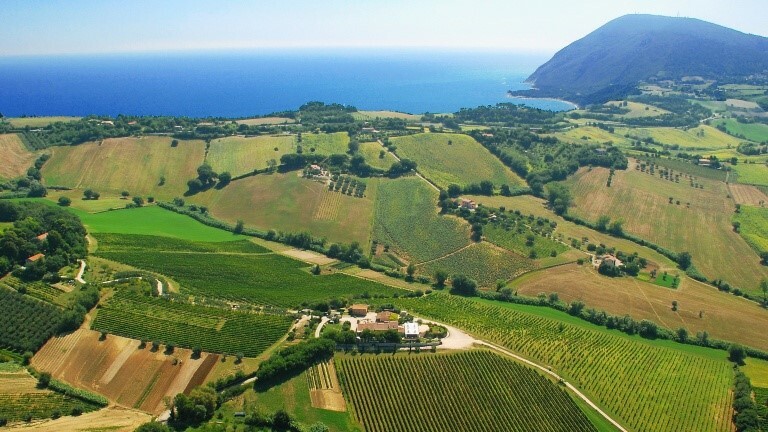 The Conero appellation is considered one of the best. Many unique wines exist in Marche such as Lacrima di Morro d’Alba, an intensely fragrant yet supple red from the North, as well as a variety of off dry sparkling reds based on the rare Vernaccia grape. The Pecorino grape is planted all over central Italy, but Marche is its home. The wines of Offida have the highest quality designation for Pecorino. Unrelated to the sheep’s milk cheese, Pecorino is thought to have derived its name from being a favourite snack of sheep (‘pecora’ in Italian) being herded through the vineyard dotted countryside. The Lacrima grape, meaning ‘tear’ in Italian, gets its name from the tear-like drops of juice that drip from the grapes when they are ripe. The great renaissance artist, Raphael was born in Marche, as well as influential educator, Maria Montessori, and opera composer Gioachino Rossini. Marche is a stronghold for organic viticulture. Around 20% of vineyards are farmed organically, representing 7% of Italy’s total organic vineyards.